Home sister visitors weekend My sister came to Georgia. My sister came to Georgia. And she wore me the heck out! My younger [and only] sister, Erin, visited last week from Kansas. She got here Saturday night and left Thursday morning. So to celebrate her Spring Break we vacationed in true family style. We ran around being tourists ALMOST the whole time. Rob and I showed her the "hot spots" of Augusta, GA.
We road tripped to Hilton Head, SC. Went on a dolphin tour.. actually saw dolphins. 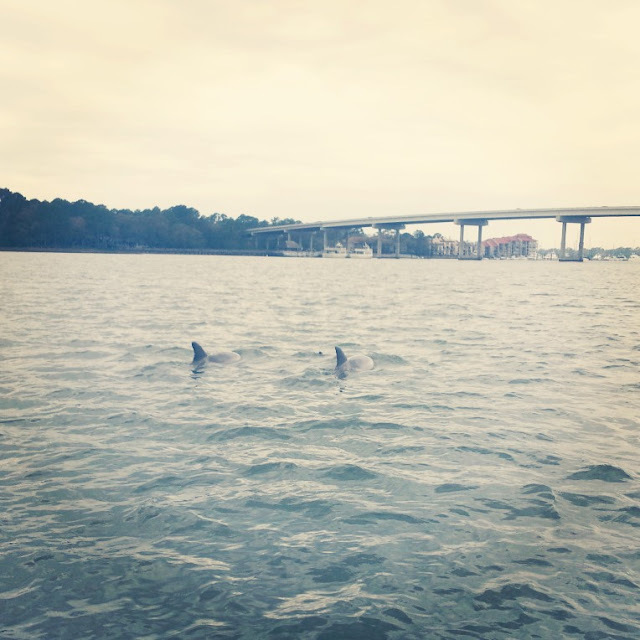 Took a million pictures of said dolphins. Shopped. Walked around. Missed an alligator tour. Drove to Tybee Island, GA. Walked up a million or so lighthouse steps. Hunted seashells on the beach. Stuck our toes in the water. Took more pictures. Became Tybee Island locals... and then finally drove home in the midst of severe weather. My sister, Erin, and I with the boat we watched dolphins on. Dolphins... a normal Monday y'all. On top of the lighthouse! Making hand hearts on the beach. We took a canal tour down the Augusta Canal. Visited the attached museum. Had dinner with our cousin Jess and Rob too. My cousin Jess, me and my sister! We road tripped to just north of Atlanta. Hiked a trail to a waterfall. Found out it was the wrong trail. Drove to the waterfall. Visited the Dawsonville Moonshine Distillery. Drank samples and toured the process. Drove to Atlanta. Went to the aquarium. Took a billion pictures within the aquarium. So between the hiking, steps, driving, 7 am wake up calls and puppy excitement... I'm exhausted. This weekend has been spent trying to get back into the swing of things. Laundry, cleaning, dishes, cuddles and naps... lots and lots of naps. Plus homework, blck. Hope everyone else is enjoying their weekend... and if you have snow, again, I am so so so sorry! Aww that looks like such a fun visit! How fun!! It looks like you guys had a blast! You guys were definitely busy but it seems like you had such an awesome time! Sounds like you had a great time! I love when family comes to visit!!!! Aw, so fun! I love the pictures and that you guys were super busy!